Photos from the Honduran Conservation Coalition website. I received an email last night from Mark Bonta, a researcher with the Honduran Conservation Coalition, alerting me to some big news from Honduras! 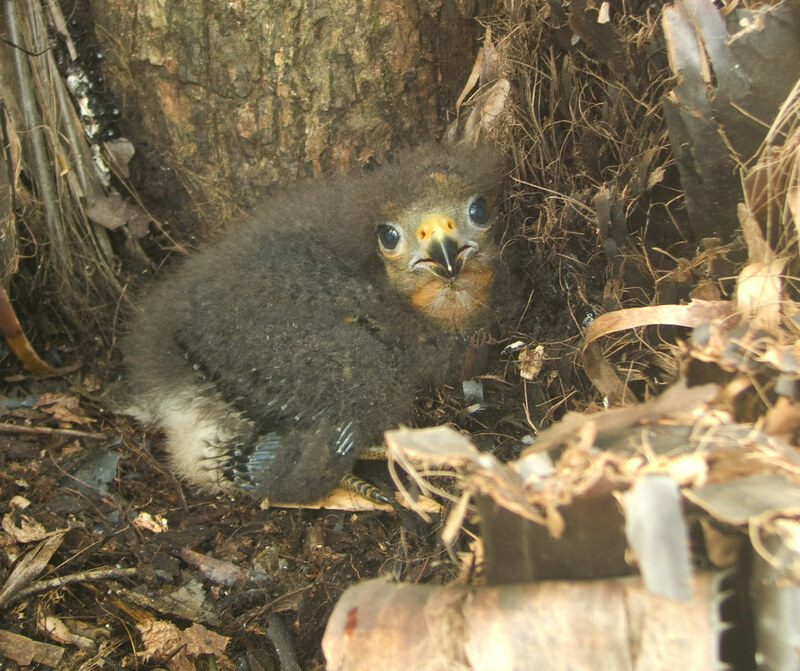 A nest of the Red-throated Caracara was found by Isidro Zuniga, a researcher with the coalition in the pine forests of Olancho province. This is a sparsely-populated region of dense forests and rugged mountains which is filled with a multitude of fascinating plants, animals and habitats. You can read the press release from this morning here. This is big news for raptor biology in general, as it is only the fifth Ibycter americanus nest found by researchers in the world, and the very first from Central America! Not only that, but on a personal note, it means that there are actually other researchers taking up study of my very favourite bird. 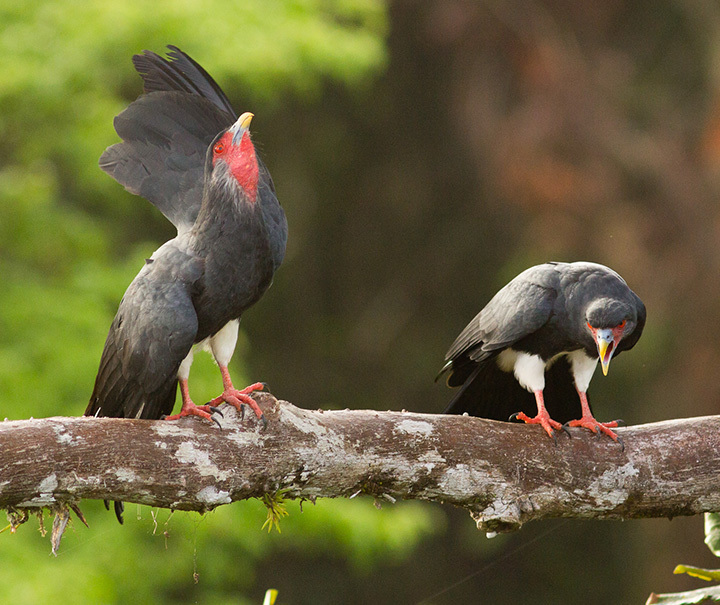 The Red-throated Caracara was only recently re-discovered in Honduras, by Narish and Jenner in 2004*, also from Olancho. This could mean that there is a stable population of this species in these pine forests, and gives some hope for its continued persistence. For too long this species been neglected by science, despite its fascinating biology, and the fact that it has been nearly extirpated from much of Central America. Now, with sightings in Nicaragua, and this recent discovery in Honduras, I think there is cause for hope for research into the conservation issues for these birds. In fact, in the press release, the Honduran Conservation Coalition, in partnership with the Peregrine Fund and others state that this is the start of a concerted research effort. The preliminary information is a but a teaser of things to come, and when these data become available they will add greatly to the known biology of the species. So far, we know that Mr. Zuniga spent six weeks observing the nest, recording prey deliveries and nestling care. The nest was in a pine tree, although from the video it is unclear whether the nest is constructed by the birds or is just a platform on a broken tree (the two nests we have found in French Guiana used a bromeliad as a nesting platform, with no nest material brought by the adults). Only a single chick was being reared, which accords well with our findings in French Guiana. The nests we found in French Guiana were in large epiphytic bromeliads, which are in short supply in the pine forests of Olancho. What could they be nesting on? There is also some video of the nest, with footage of adults and the young bird. I am really excited by these findings, and I eagerly look forward to learning more. How many adults brought prey? What was the nest made of? What kinds of wasps were they preying on? What types of fruits, if any would they find in the pine forests? All these questions will no doubt be answered in time, and as always, I will be eager to learn more about this awesome bird! *Narish AJ., Jenner T (2004) Notes on the Red-throated Caracara, Ibycter americanus in Honduras. Cotinga 22: 100. This is great news! I am happy to hear this. There was also a recent sighting a couple months ago in Soberania National Park in central Panama, very exciting as well. I would love to see this species make a comeback in Central America. That would be great! All the way to Mexico, if possible!